What do you get when you combine a love for western cowboy boots, horses, and clothing? Partners Western Company. Friends Lisa Moore and Stephanie Garwood were able to see their dream become a reality when the store opened October 2013 in the Walmart Shopping Center in Mocksville. Partners has something for everyone in the family. ''We have boots, hats, apparel, one of a kind jewelry and fashions you wouldn't find anywhere else. It's like a western boutique,'' says Lisa. ''I grew up showing horses and I've wanted to own a clothing store since I was 12,'' explains Stephanie. Stephanie would soon see her dream begin to play out when friends and owners of Partners Tack and Western Wear, originally of Lewisville, were talking about selling out. Friend, Lisa Moore's 30 years of sales experience and love for fashion cowboy boots (she owns about 60 pair) and western wear also became an integral part of taking a leap of faith and making a dream reality. The two friends looked all over the area for the perfect place to start their business. 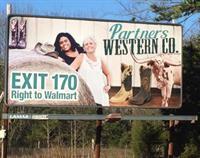 Not only do these ladies love all things western wear and horses, but they also love Davie County, ''I love Davie County and the people, there was nothing like this in Davie,'' states Stephanie. Being able to expand in the future was another reason that the Walmart shopping center seemed to be the perfect location. The future for Partners Western Company is bright.